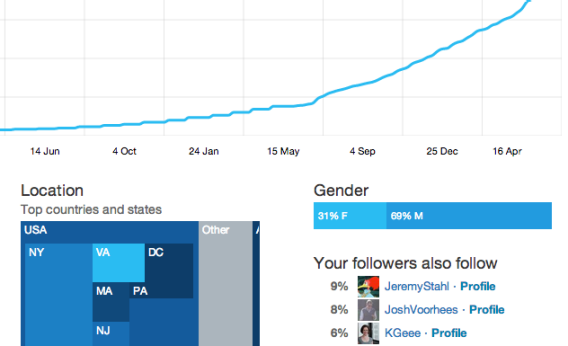 Twitter analytics: Tool lets you see which tweets your followers are actually reading. Twitter appears to be rolling out a new analytics tool for regular users, not just its professional customers. Twitter has allowed website owners to track their traffic from the site since 2011. Unless there’s been some mistake, it now appears to be opening up a similar feature to all users. Twitter user @bdconf noticed yesterday that logging into analytics.twitter.com brings up a page designed to help you get started advertising on the site. From there, clicking “analytics” in the top menu bar allows you to view things like where your followers are located, who else they tend to follow, and how many people clicked on each of your recent tweets. Checking on my own analytics, I was surprised to find that 69 percent of my followers were male; that I have more followers in London and Paris than in U.S. cities like Los Angeles, Chicago, or Boston; and that my most-clicked tweet of the past two months was this one. The tool doesn’t seem to be fully operational for everyone yet. Tech writer Alex Howard tweeted that he can view his timeline analytics but not the analysis of his followers. My colleague Forrest Wickman said all of his tweets come up as having zero clicks, even some that received more than 1,000 according to Bitly’s tracking tools. I’ve emailed Twitter for more information and will update when I hear back. Until then, you can try it yourself by visiting https://analytics.twitter.com, logging in, and clicking “analytics” on the top menu bar. The tool isn’t perfect—it doesn’t show you how many people actually saw each tweet, for one thing. Still, it’s a rare chance for the average user to get a glimpse at some of the types of tools that Web publishers have at their disposal, and reinforces the sense that your Twitter account is your own personal publishing platform. I hope it’s here to stay. We’ve been experimenting giving the analytics feature to small groups of users outside our advertising clients. We’ve been happy with the response thus far, and will determine next steps after the conclusion of these tests. That doesn’t clear things up very much, but it’s all we’ve got for now.